Wednesday, November 9th, the inaugural SciTech Northwest event was held in Seattle. 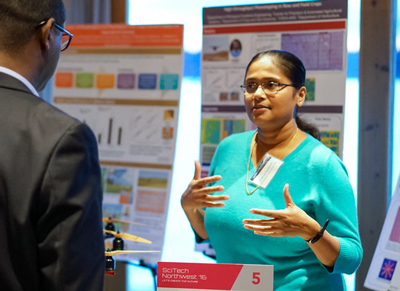 This was the region’s first science and technology expo highlighting the latest innovations and collaborations in cyber/data analytics, clean energy, and biotechnology from three premier Washington research institutions. Twenty one groups and five speakers from Pacific Northwest National Laboratory, University of Washington, and Washington State University showcased their cutting-edge technologies. The featured speaker was Matt McIlwain, Managing Director, Madrona Venture Group.